In other words, you aren’t limited to the factory settings most iPhone stands deliver, such as vertical or horizontal, meaning there is a whole new world of possibilities. For example, you can angle the Pocket Tripod to take a photo of an item up above in the sky, or angle it down toward a professor during a classroom lecture, no matter where you’re seated. Or imagine the Pocket Tripod placed on your car’s dashboard, transforming the iPhone into a practical GPS alternative, as opposed to one that could get you a ticket as you constantly fumble with it while driving. 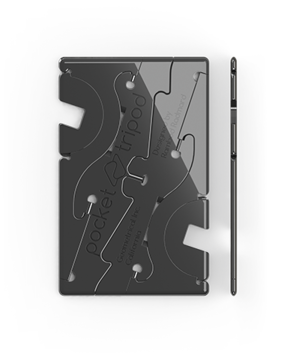 The best part though, as far as this blog is concerned, is that the Pocket Tripod fits into your wallet alongside your other credit cards. 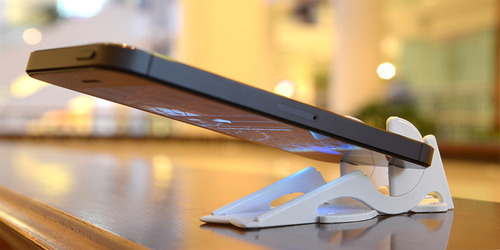 Despite being much more advanced than other iPhone stands, it is the same size as a credit card, and only twice as thick. Compare this to existing clunky iPhone stands that take up lots of space and don’t fold up, yet only manage to pull off a few different viewing angles. While this all sounds super cool, the Pocket Tripod is still just a prototype, which was helped along by the imagination of 3-D printing. 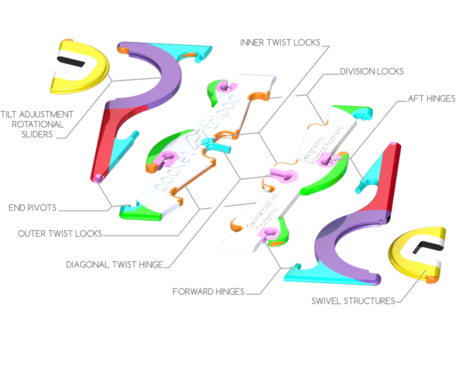 It’s actually six different pieces that come together to form the shape of a credit card. And despite its compact size, it consists of all types of engineering feats, such as locks, hinges, swivels, sliders, and pivots. Unfortunately, that complex design will require some expensive molds, so the company has taken to Kickstarter to get the funding needed to produce it commercially. If you’re interested in purchasing one of the Pocket Tripods, you can back the company’s project at Kickstarter for as little as $20 to get your hands on one by June 2014. Yeah, it’s going to take a while to actually produce these suckers, but crowdsourced funding is a cool way to help a small company develop a groundbreaking product. Check out the campaign here. If you want the Pocket Tripod even faster, by around November 2013, you need to up your donation to $25. Also available are t-shirts and limited edition early molds of the device. At the moment, Pocket Tripod is offered in white, black, and the company’s signature green/black color combination. And it comes in two models for the iPhone 5 or iPhone 4/4S. Read more: Now you can eat with your credit cards, literally! Next Next post: Are Credit Cards Recyclable?